Jacob's Crackers: "FORAGING & WILD FOOD ". Braised field & wild mushrooms , thyme butter , parmesan & truffle oil . "FORAGING & WILD FOOD ". Braised field & wild mushrooms , thyme butter , parmesan & truffle oil .
" FORAGING " is far from being a recent fad . It is a practise known to mankind since day one . Seeking out . picking and gathering from the wild are indigenous ways to appreciate and love the wonderful larder of the country side . Whether your bounty be Fruits , Berries , Nuts , Seaweed , Herbs , Wild leaves , Or Wild mushrooms , it is an "Enjoyment of Nature " and a quest for " Taste and Quality Of Wild foods " and the bonus is , It is Free . I can relate to WHY , pay premium prices for organic wild mushrooms in the shops when you can pick them in the wild for free . But Bill O'Dea , a dedicated Mycophagist , cannot stress enough , how careful people should be before eating anything that they are not 100% sure of . But help is on hand by Mushroomstuff .com . Mushroomstuff is run by Bill and Freda O'Dea , both well known in Ireland for their legendary mushrooms hunts in the hills around Dublin , Wicklow and Kerry . Bill also leads groups on mushroom hunting trips to France , Spain and Turkey . If you want to pick up this Knowledge and have a great day hunting in the wild and eating the fruits of your labour , you can check on some of their events coming up on www.mushroomstuff.com or follow Bill on Twitter @mushroomstuff. Bill is a member of Coford , a funded workgroup to promote edible fungi in Ireland and an active member of Slow food . However , if you are on the lazy side and not into Foraging ( like Me ) , The Food Hall @ Fallon & Byrne has a great selection of Wild Mushrooms . Here is a delicious recipe for the harvest of your hard labour . A great Starter or smaller bite sized makes , great Canapés. 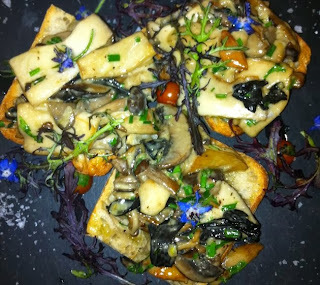 BRAISED FIELD&WILD MUSHROOMS , thyme butter , parmesan shavings , white truffle oil . 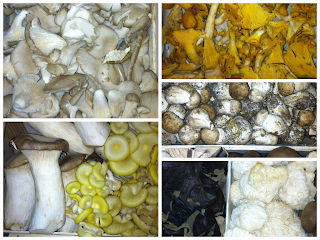 250 grms of medium field & wild mushrooms , wiped clean or brushed . Mix the butter with the thyme and wrap tightly in cling film . Roll into a sausage shape , tie one end and roll while twisting the lose end until you get an even sausage shape . Tie and chill until needed . Now in a heavy bottomed pan , heat the olive oil , add the mushrooms and a good pinch of Maldon sea salt ( this prevents the mushrooms in releasing any moisture ) . Sauté the mushrooms , while stirring constantly until the mushrooms have got some colour and soft but still with a bite . Add the crushed garlic , and stir for 30 sec , making sure it doesn't burn . Add some of the thyme butter and season to taste . Once the butter starts to foam , add i the cream . Stir to combine the flavours and allow to slightly reduce . Some baby salad leaves , dressed in a little Extra Virgin olive oil & lemon juice . It is not difficult to know which mushroom may be poisonous to you but some people are so naive that they don't care about it and die eating poisonous mushrooms. I recommend not to use mushrooms in your food if you don't have the idea about how to identify poisonous mushroom. I totally agree and I have said so in my post in the 2nd paragraph. 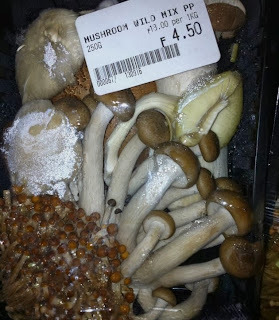 For people who are interested in foraging for wild mushrooms , they should be careful and go to learn about the different species ie: from Bill O'Dea of mushroomstuff.com or otherwise to just purchase from a reputable store .